Take action to encourage. Why? Encouraging your spouse, especially in a time of uncertainty and overwhelm, has more of an impact than praise after a success. But sometimes you don’t know where to start. So you don’t do anything. it’s imperative to encourage your spouse in some small way. 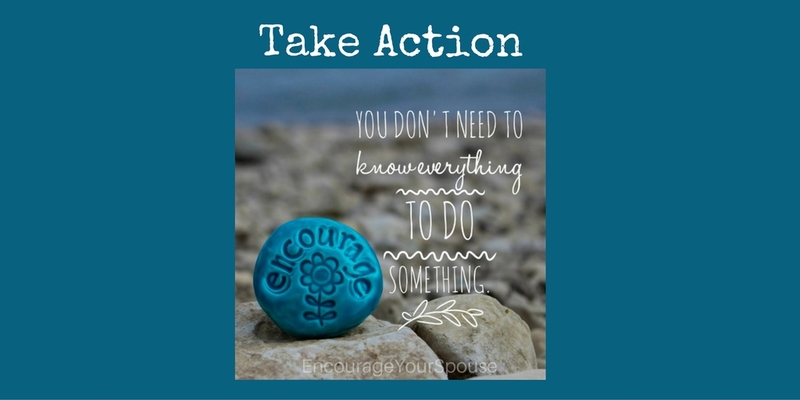 Taking action kicks procrastination to the curb. It releases you to take more action. Take a small, good action, and feel more in control. 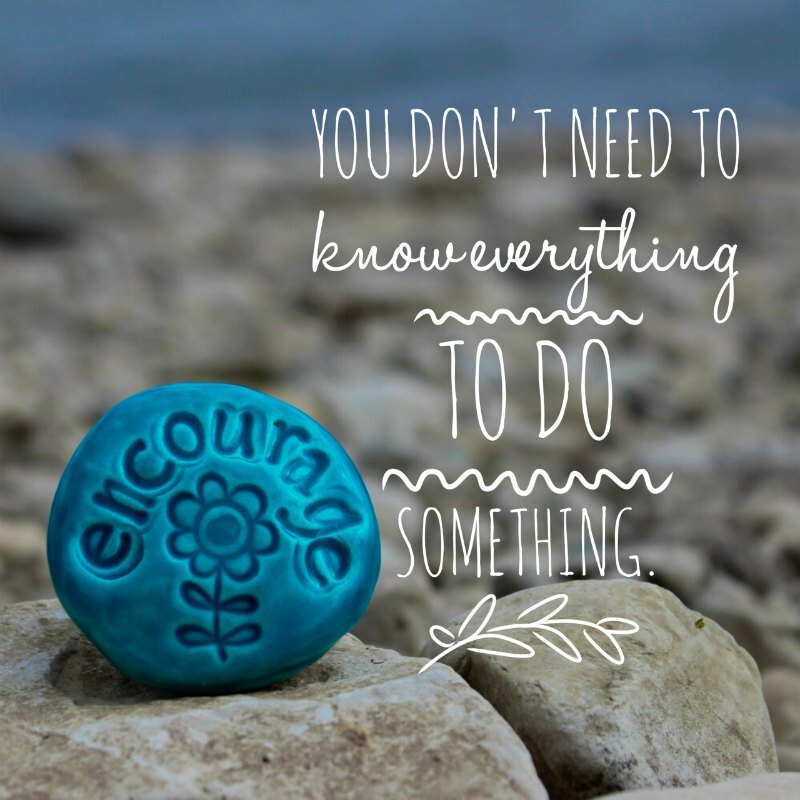 Even if you don’t know what’s next -Take action to encourage. Break it down. Small bites. Take action to encourage. However, you can take action to learn. Learn more. One step forward. One action farther. Make it a good step – an encouraging action. Just because you don’t know… is not a pass to procrastinate! You don’t get to stand still. 1 – Pray. Take action to encourage. Yes. Prayer is an action. Let your spouse hear you praying. Build reminders into your life to remind you to pray. Pray together. Reach out – ask others to pray for and with you. 2 – Search for a mentor/role model to take action to encourage. Maybe the “someone” you find for inspiration and consolation isn’t close – or even alive. You don’t need to intimately know a particular person – it’s possible to use a stranger as a role model. Dig into this person’s life to understand their values, their strengths (and weaknesses), what actions they take when under pressure, who they admire and from where they get their encouragement. Don’t forget to look at Biblical role models as an example. Those people in the Bible were real people – like you and me. Their stresses and discouragements might not have been outwardly shaped like yours or mine, but they had the same root – and the same liar tried to tear them down and separate them from their Hope – their God. How did they react when faced with disaster? From where did their help come? Who surrounded them? A mentor/role model is a source of encouragement in a time of trial. You don’t need to know everything to do something. 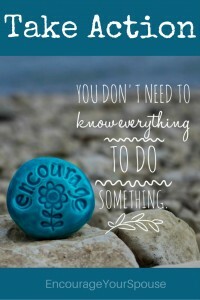 Encourage. One action. One step forward. Shake off your paralysis. Your only guarantee in life… is change. This time will pass. It will. 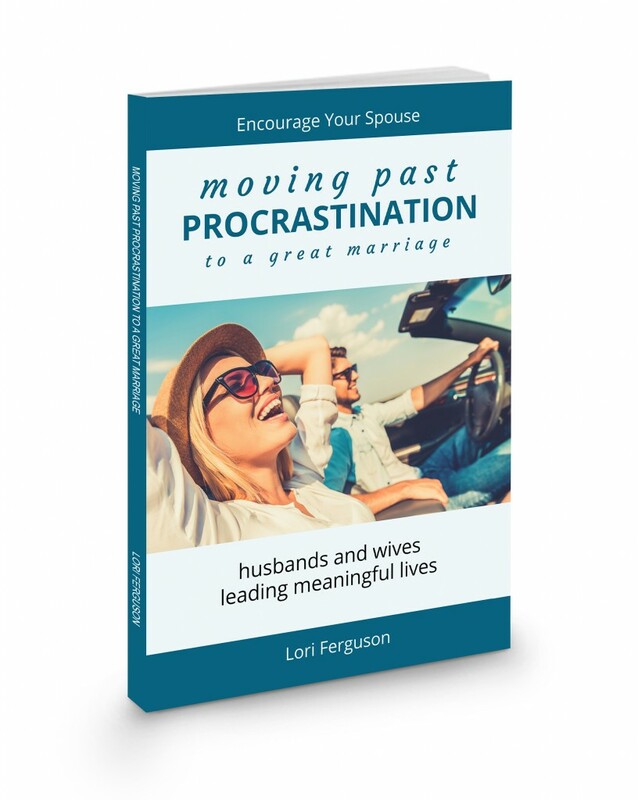 Encourage your spouse – and yourself – all the way through.